I finally bought acouple organizing bins and went through their big toy bin that was holding everything, including a forgotten and very gross looking banana! The biggest thing I learned was keep the big toy bin for BIG toys. I was in the bad habit of throwing everything in there and it just became a huge mess. Also, the kids weren’t playing with half their toys because they were buried at the bottom. Then I grabbed a garbage bag for broken toys and a box for donations. I filled up both! I also learned the original containers that toys come in can take up so much space, including puzzle boxes. I took them out of the boxes, put them in baggies, and into ONE container. Not only does it make it easier for him to find his puzzles, but also clean them up and keep them all together. 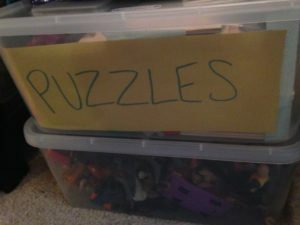 Same goes for the new tub for his race cars, playdoh sets, and actions figures. 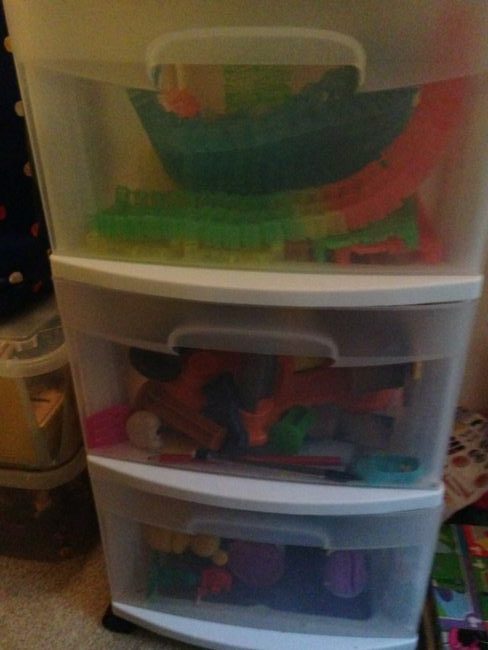 Yes believe it or not, but these separate containers help my kids with clean up time. It keeps us in the better habit of putting away one set of toys before playing with the next. 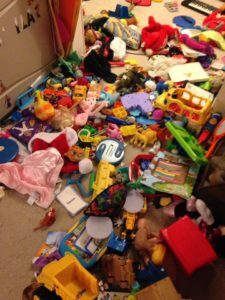 Finally, you know that “weight off your shoulders” feeling you get after you finally do something, just wait until you declutter and organize the toys taking over your house!